Julie Wright is general manager, online advertising. 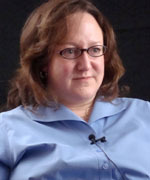 She came to the Anchorage Daily News in January 2006 as managing editor from the Star Tribune in Minneapolis, where she created several suburban weekly sections. Previously, she was an editor and reporter at the Wichita Eagle and the Jackson Sun in Jackson, Tenn. She has bachelor's degrees in journalism and political science from the University of Missouri. Julie Wright, general manager, online advertising, the Anchorage Daily News, introduces herself and summarizes the key skills needed to compete in the digital age. Julie Wright, general manager, online advertising, the Anchorage Daily News, describes the important contributions of her newspaper to its community. Julie Wright, general manager, online advertising, the Anchorage Daily News, describes some revenue channels her newspaper has tapped with its digital editions. Julie Wright, general manager, online advertising, the Anchorage Daily News, describes how individuals entering the newspaper field need to prepare for their careers.